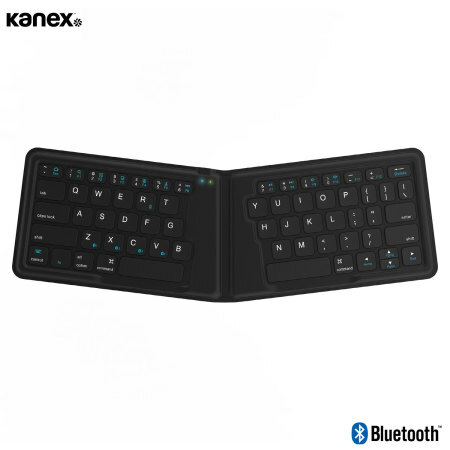 This ingenious QWERTY keyboard from Kanex folds in the centre when not in use, creating a compact, lightweight and ultra-portable solution for typing on the go. 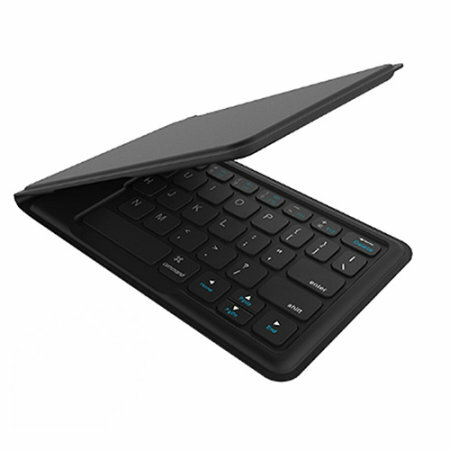 The keyboard is also universally compatible with all Bluetooth devices. Not everyone is a wizard with their smartphone or tablet's virtual keyboard. When you need a physical typing experience, only a physical QWERTY keyboard will do, and you need something that doesn't take up too much space. Enter the Kanex MultiSync. Fully foldable along a seam in the middle and boasting a rich, tactile physical typing experience, the MultiSync is the only keyboard you'll need on business trips, holidays or just for blogging in the comfort of your own home. 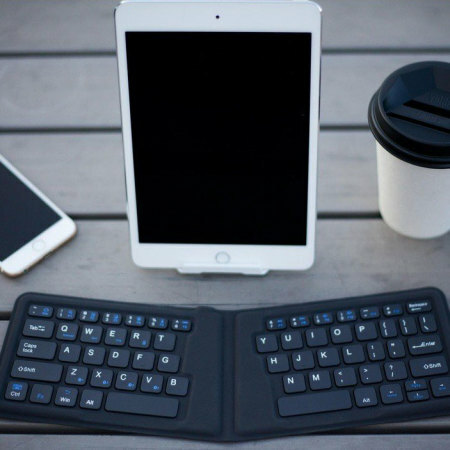 The MultiSync keyboard folds in the centre and features a magnetic closure mechanism, ensuring that this keyboard is ultra-portable and can travel with you wherever you go. When you need to use the MultiSync, simply unfold the keyboard and the magnetic closure system will automatically wake it for instant typing. 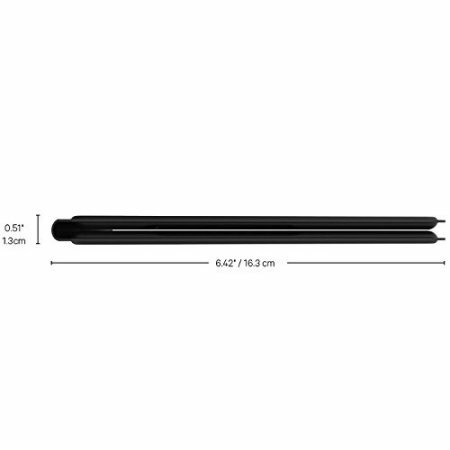 Typing on the MultiSync is a satisfying, ergonomic experience thanks to well-built keys with slightly rounded corners, along with a shape designed to fit the contours of the human hand. Key travel is just right - you'll feel each click of the keys, but you won't need to push hard to type. Thanks to Bluetooth technology and expert engineering, setting up the MultiSync with your device couldn't be simpler. Simply find the keyboard in your device's Bluetooth menu and follow the pairing instructions on screen. Need to switch between several devices on the fly? Maybe you're storing important work on different devices and need to access and edit files quickly on each one. The feature that gives MultiSync its name allows you to connect the keyboard to up to 4 devices simultaneously, so when you need to switch, simply press the corresponding key on the keyboard and hey presto - you're connected to a different device. No matter what your daily driver may be, you can take advantage of the MultiSync's features and capabilities. All you need to do is connect the keyboard via Bluetooth to your phone, tablet, laptop or other device - whether iOS, Android or Windows. Practically every device on the market is catered for by the Kanex MultiSync. You'll never need to worry about your MultiSync being damaged in a backpack, or sustaining damage in transit. That's because of a sturdy welded build which emphasises hardy resilience, as well as a magnetic closure mechanism which keeps your keyboard safe while on the move. Changing batteries is a thing of the past with the MultiSync's rechargeable Li-ion battery. If your keyboard runs out of juice, no worries - simply connect the included cable to a powered USB source (laptop, mains charger etc) and in no time at all the keyboard will be charged and ready to go. You can tell exactly what state your keyboard's in with the MultiSync's LED indicators. Blue means you're connected. Green means a full charge. Red means low battery.